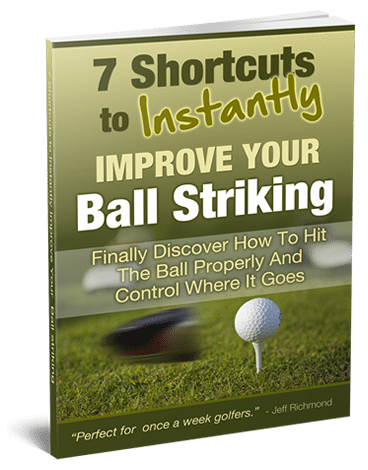 The order in which you swing the golf club has a major effect on the distance that you can hit the golf ball. If you have the incorrect sequencing of the golf swing it can cost you a lot of distance and not to mention accuracy as well. 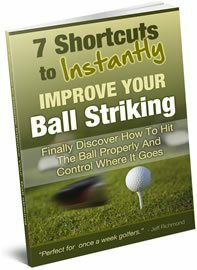 So if you’re like most golfers who want to hit the golf ball as far as you possibly can — you’ve got to understand the correct sequence of the golf swing. To get started let’s look at what should happen in the sequencing of the backswing. When you start your backswing you should do so with the big muscles e.g. your back and shoulders. You should not start your backswing with your hands e.g. picking the club up. Now as you’re starting the backswing by turning your shoulders and back you also need to shift your weight to your right foot. You need to continue to shift your weight to your right foot as you’re turning your shoulders and back on the backswing. And keep doing this so that at the top of your backswing position you have about 85 – 90% of your weight on your right foot. So you can sum up the backswing as a shift and turn. Now at what part of the golf swing does the most power come from? And the transition in the golf swing is when you change directions from the backswing to downswing. Just think, if this wasn’t true you’d have golfers setting themselves into a perfect top of the backswing position and then swinging from there. But that doesn’t happen and never will because it’s the change of directions from moving the club back to bringing it down where the real power in the golf swing comes from. And that’s the key place in the golf swing where most amateur golfers lose a heck of a lot of distance. This is through a lack of the correct golf swing sequencing. Imagine you’ve reached the top of your backswing position. What do you think should start the downswing? The correct answers is: The weight shift should! To start the downswing you need to first move your weight back to your left foot. Then you need to move your left knee towards the target, then the left hip needs to move towards the target, followed by the left shoulder and finally your hands should move. The sad thing is that most golfers start their downswing with their hands and that’s a killer as far as creating distance is concerned. You’ve got to start the downswing with the weight shift and then the left knee. So go out and try this now…. To do this I want you to swing slowly back to the very top of your backswing. Then when you’ve almost reached the top of your backswing position I then want you to move your weight back to your left foot and then move your left knee towards the target. Once you’ve got the feeling of doing this then speed up the swing. Now personally I just like thinking about moving my left knee towards the target to start the downswing. And I suggest you try that golf swing trigger as well. If you get this sequencing correct from the backswing to downswing you’ll gain a lot of distance and the golf swing will be easier. Try it…you’ll love the results!